Looking for a convenient way to convert MBOX emails to PDF to generate forensic evidence for court? Here we are with the perfect method to save emails in PDF format. Just like our way of life, the crimes are becoming more and more complex. For this reason, the digital forensic branch of investigation has thrived in recent time. The main task of the digital forensics investigators is to collect the digital evidence of any crime and provide it into the court of law in legally admissible format by export emails into PDF format. Since the whole point of this investigation is to get justice in the Court, admissibility of the evidence bears utmost importance here. Emails are not only a major mode of digital communication, but it is also a significant source of evidence against criminal activities. But the biggest challenge for the forensic investigators probably is to have evidence that is admissible in Court. The reason being only a few file formats like PDF is legally acceptable as evidence. In case of other file formats, they need to take the help of file conversion. One of the common conversion requirements of the Forensic investigators is MBOX file to PDF. MBOX is a common file format used by various email applications. Since MBOX emails cannot be submitted directly as evidence in Court, users need to save emails as PDF. This post has been designed to address this issue and hence, we will describe the method and most recommended Forensics tool to convert MBOX emails to PDF. Open File Explorer and select View tab. Click on Options and Folder Options window will pop-up. Select View tab again in that window and uncheck “Hide empty drives”. Click on Apply and you will be able to find out the MBOX files in their location. Now that you can easily distinguish MBOX files among all other file formats, it becomes easy to collect MBOX files for evidence. Later, all the investigators have to do is to use Email Examiner Software to convert those files in PDF format during the forensic investigation. This potent application offers complete email application examination and analysis service that supports both desktop-based and web-based email applications. Apart from helping the investigators to inspect the emails stored in an MBOX file, the tool also allows users to convert/ export emails into PDF file format. By following these steps, Forensic conversion of MBOX file to PDF can be done easily. 1) Launch MailXaminer software on the computer. 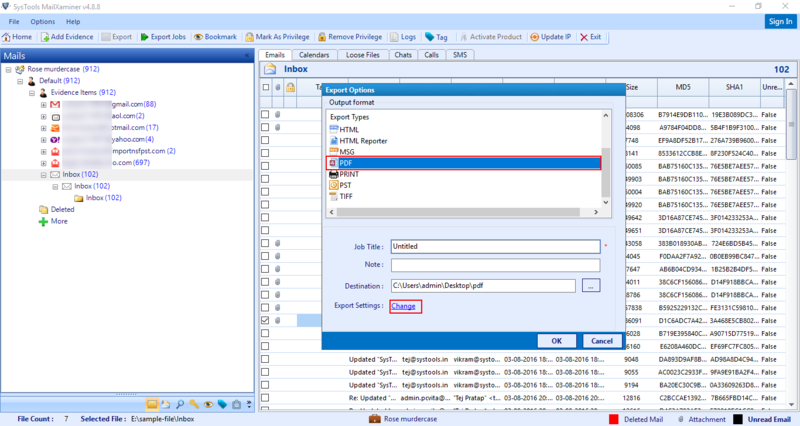 2) Add the MBOX file into the software through the Add Evidence Button of the tool. Which allows you to select the appropriate email file format. 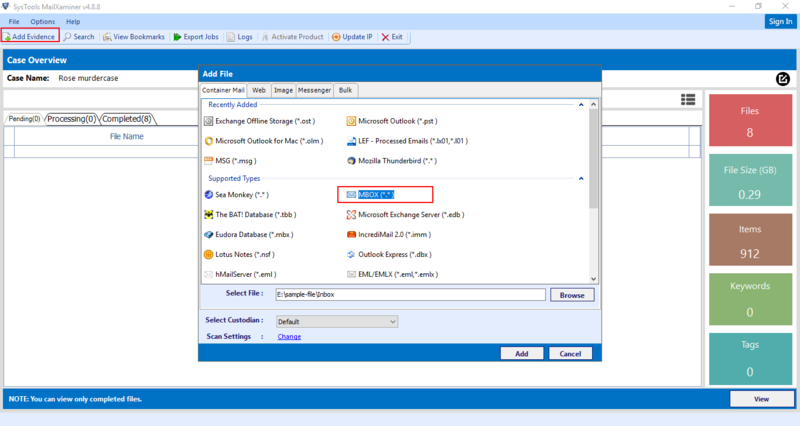 Choose the MBOX format from the Container Mail section of Add File window for import MBOX file. 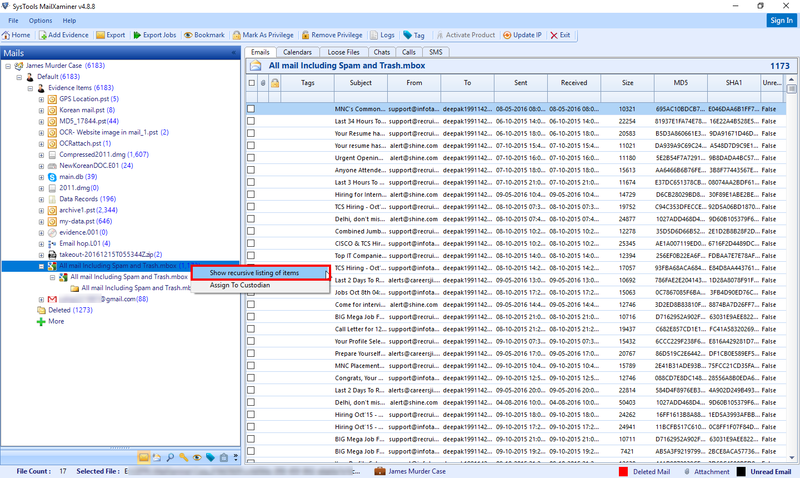 This will help to extract emails from MBOX. 3) Before converting MBOX emails to PDF the forensic tool allows to display the complete email data present in the MBOX file either recursively or folder wise according to the user preference. This helps the investigators to analyze the email data easily before the conversion. 4) If you want to export emails into PDF selectively, right click on the item that you want to convert into PDF & choose Export option. User can also convert bulk set of email data into PDF file by exporting emails in folder wise through the export button in the tool. 5) The tool allows to export email data into various file formats, select the PDF format from the Export option tab for save emails as PDF from MBOX file and click on the Export Settings for additional PDF export settings options. 8) From the Export Settings window PDF Settings tab for change the PDF export options. Which provide Four options such as “Page Layout, Properties, Attachments, Bates Number”. Page Layout: Through the Page Layout option user can change the Margin size, Paper orientation, Page size, Headers & Footers etc. Properties: By this properties option user can save emails in PDF based on the properties they want to export. They can select and export properties such as “Transport Message Header, Sender email address, Subject, SHA1 etc”. This will help to avoid the exportation of unwanted content. 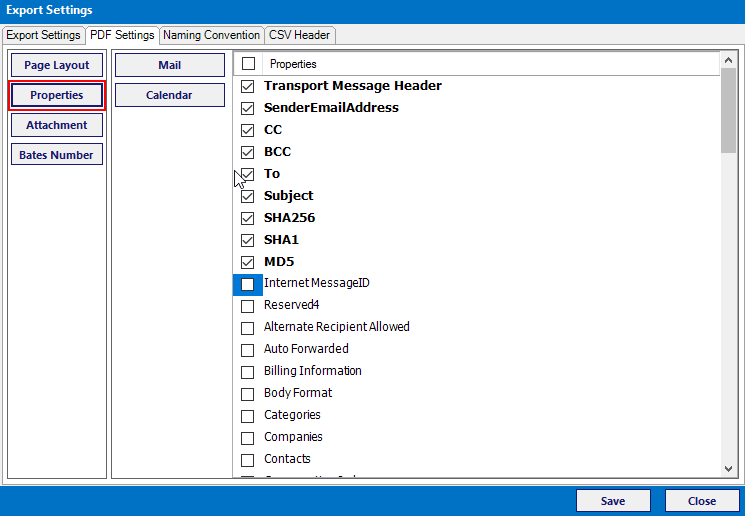 This option allows the user to set the properties of Email and Calendar data separately. 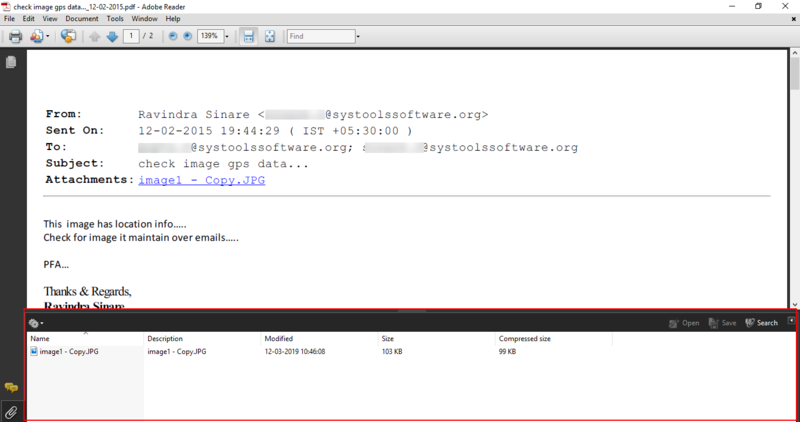 Bates Number: When export emails into PDF this option allow to providing the Bates number and Date stamp for PDF file. Which help to avoid the alteration of evidence after the generation of evidence report. 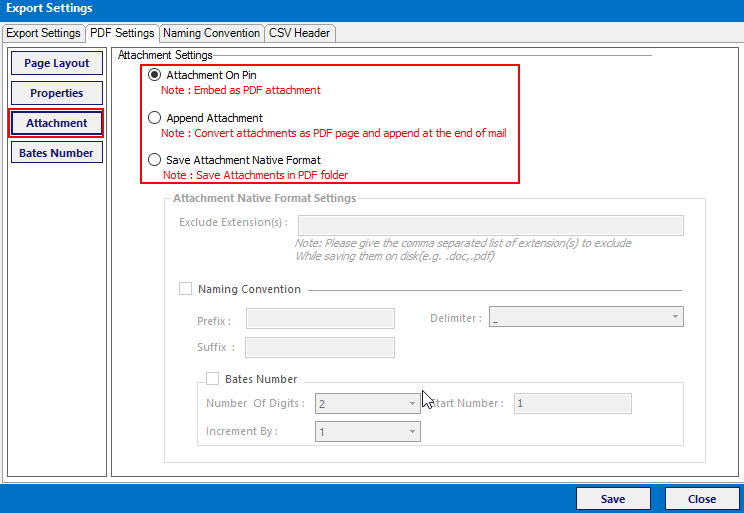 Attachment: Through the attachment option of the PDF file, user can convert email files with attachments in three different forms such as “Attachment On Pin, Append attachment, Save attachment Native Format”. 1. Attachment On Pin: In this form the Attachment of the email file will be pin with PDF file. The user can view the attachment through the attachment section of the PDF viewer. 2. 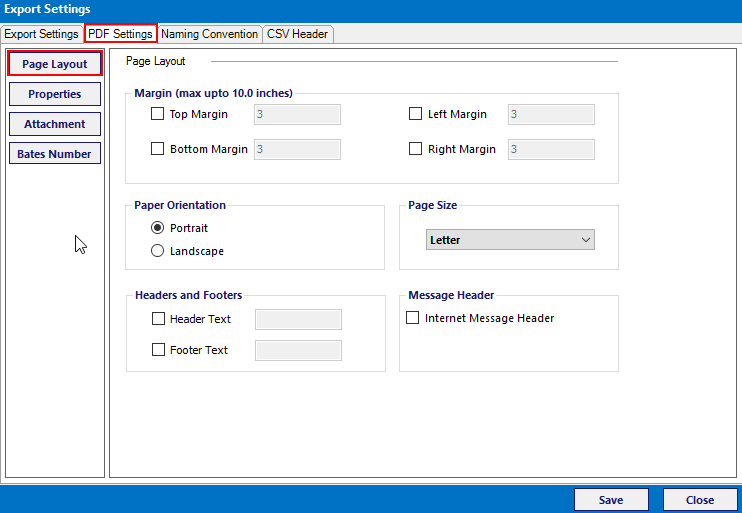 Append Attachment: It will convert the attachment into the PDF file and append at the end of the PDF file. 3. Save attachment Native Format: In this format, the attachments are saved in its original form in the same folder of PDF file. Choose the destination location for the PDF file and the software will convert MBOX emails to PDF to generate forensic evidence for court. Forensic investigators often face the need to convert MBOX emails to PDF to generate forensic evidence for court. But during the Forensic Investigation on email data performing analysis of evidence and generation of court admissible report using different tool makes the process more complex. To avoid this situation and meet the proper requirement to help the investigators, MailXaminer is the right software solution. 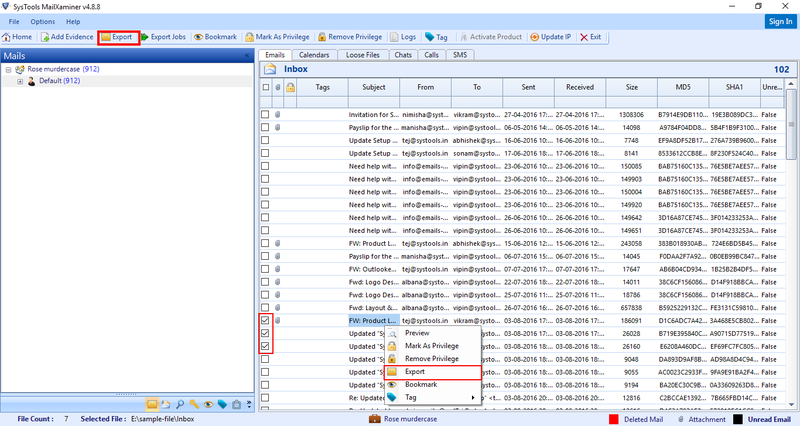 With its help, digital investigators can extract emails from MBOX and save emails as PDF file. Which helps to generate and submit the legally admissible PDF files in Court as the evidence.